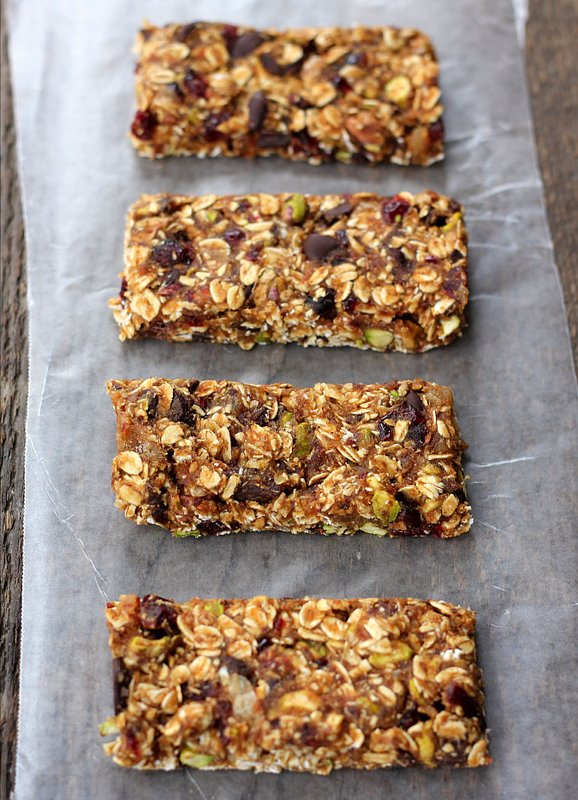 i'm absolutely in love with making homemade granola and granola bars. don't get me wrong, store-bought granola is great and all, but there's nothing quite like making your own and knowing exactly what's in it. 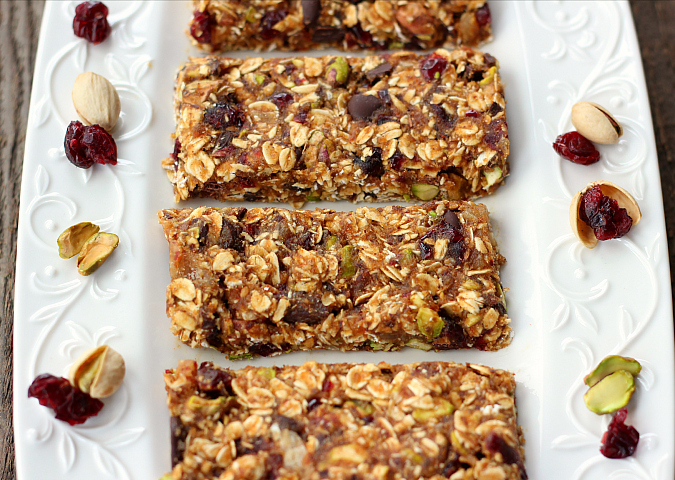 over the weekend i made these no-bake granola bars. they have such a wonderful depth of flavor thanks to everything that's packed in them: cinnamon, peanut butter, oats, pistachios, cranberries, chocolate, and ginger. 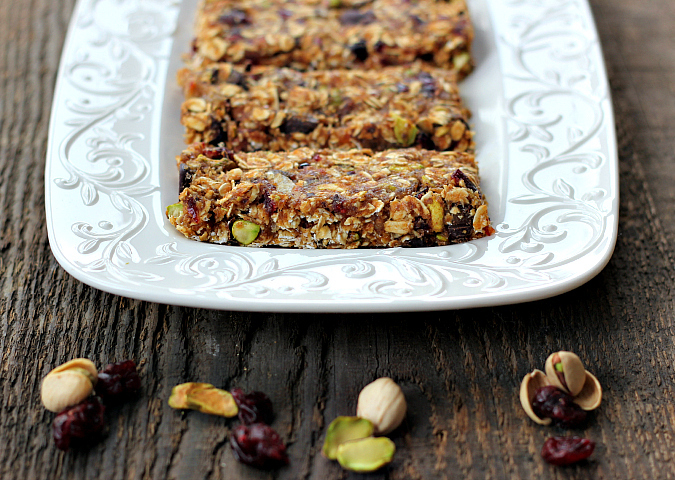 i opened up my kitchen cabinets and threw into these granola bars whatever i could find. all of those ingredients are held together by dates. dates are truly amazing. they are like a natural sweetener (no need for sugar or honey in this recipe) and they act like glue to hold all of the ingredients together. 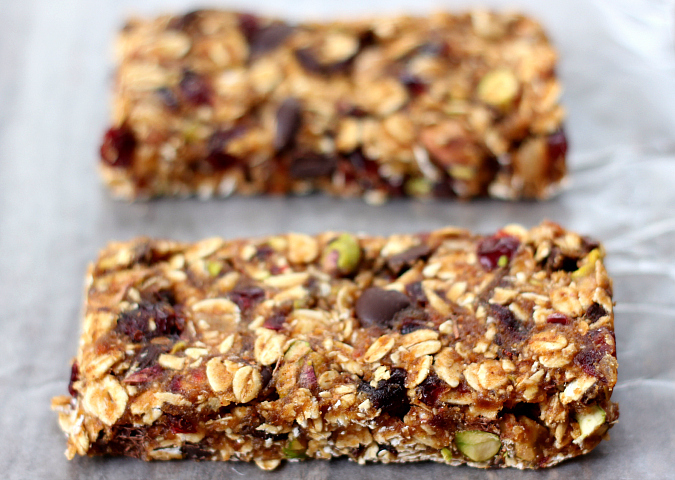 these granola bars taste amazing and they come together in no time at all. you don't even need to turn on your oven to bake them. they are packed with power ingredients, they are hearty, they are wholesome, and they are naturally sweetened. they're vegan and gluten free too! they make a great on-the-go snack. healthy and easy! in a food processor, puree the dates. add the water gradually as the food processor purees the dates until a moist paste forms. blend in the cinnamon and peanut butter. transfer the paste to a large bowl and add the salt, oats, pistachios, cranberries, chocolate, and ginger. stir well until everything is evenly incorporated. line a 8-inch square baking dish with parchment paper. spread the mixture evenly in the baking dish. press the mixture down firmly with your hands. cover and refrigerate for at least 1 hour before cutting into bars with a sharp knife. store in the refrigerator until ready to eat. I like the idea of the dates holding everything together. They sound like a healthy snack with all the oats and nuts.